Big thanks to Toby Harriman, our featured guest photographer for June, 2015. We appreciate his time, and the beautiful photography he's shared with us! Please visit his links to see more of his work, and to let him know you enjoyed this interview. :: You went to boarding school in New Hampshire, and have said that's where you knew you wanted to go to art school. What about that experience made you want to pursue an artistic career? To be honest, I knew I wanted to do art when I was in the second grade and on the car ride home from school one day, I told my mom I just wanted to do art all day long. She told me I can, I just have to get through the math and English classes first and could then go to art school for college. Let's just say from then on out I struggled getting by in English classes; just not my forté. But to this day my goal is to "do art all day" for the rest of my life, as a passion and a career. Every school and grade I went through, I would fall in love with whatever art class we had to take. And I would do anything I could to take more art classes over regular ones if the opportunity was there. What may surprise most people is I didn't really start with photography. I took pictures growing up, like family vacations and such, nothing I would consider "art" yet. And while at boarding school, what I really enjoyed and became obsessed with, was ceramics. That was pretty much all I ever wanted to do. I even won a statewide award for one of my pieces. Boarding schools have these things called study hall, meaning every night (but Saturday) for two hours, we have study hours. And if you had bad grades you had to work in the proctored cafeteria rather than your dorm room. That was me! Until I found ways to get permission to get excused from it (muhaha)! My attention span isn't good in big open spaces anyways. I get way too distracted with, everything! And what did I do during most study halls? I went to the ceramics room to throw pots every night. When I didn't have my homework finished for classes, all the teachers knew why. Someday I want to get back into ceramics, and get a home with a studio just for it. But let's step back a little. The school, Holderness, was not really the right fit for me. It was a big ski/sports school and housed a ton of very bright people, who test very well. I can't say it was a complete mistake though, and I definitely loved many aspects of it. I don't regret it and I think it may have helped direct me to where I am, because it taught me that I didn't want to go to college for a regular degree. I was also very athletic growing up, at least until I came out here to San Francisco and became an artist. How do I know I was destined to be an artist? For example, in high school I did freshman year twice, one year as a sophomore, half of junior year where I then switched to a senior and graduated early to go to art school. And in college, I played Division II Golf for a bit, then quit. Then played again the next season before quitting soon after. All because I wanted to put all my attention towards art, knowing I can play golf my whole life and didn't want to ever try to make a living at it. I did one year of Industrial Design and three years of Web Design before getting out early and taking an AA degree. Now I feel i am where I need to be, I battled a lot to get here, but there is no turning back. Being a freelance photographer isn't easy. It's scary, to be completely honest. Pay and work is inconsistent, well, everything is. You spend 80% of your time doing business at home and maybe 10 to 20% actually shooting. Sometimes you don't get any work. All in all, I wouldn't trade it for anything. :: What drew you to a camera over painting or drawing or other mediums? And what drew you to outdoor photography, as opposed to a different type of shooting? Trust me, you don't want to see me draw or paint, it's embarrassing! As far as outdoor photography, I just love being outdoors, being with friends and seeing the beautiful landscapes this earth has to offer. I also like doing fine art and knowing that I am the only person I need to please when I create a photo, rather than shooting stuff like weddings or portraits, where you have to please the subject and or a bunch of clients, and where you have to set the stage rather than let the stage set it self. When I started, I actually did a lot of product photography; I could do it from home and make some money on the side while in school. I enjoyed it for a bit, but it wasn't for me going forward. I am fortunate enough now to be working with a few clients who trust and believe in my style and let me have a bit of creative freedom. I market myself that way and in return I have received jobs and opportunities that have given me a career doing what I love and am passionate about. As much as I love shooting outdoors, this career requires a lot of time inside behind the computer. It makes it a nice balance though. :: You said you went to two years of art school before deciding to forego the BFA and go right in to shooting full time. What happened during those first two years that made you realize moving on outside of school was the best? I actually went to school for four years but still only ended up with a 2-year degree (haha)! When I first went to school I wanted to go into Transportation Design oddly enough. I quickly realized that was not at all what I wanted to do. If anything, I would have switched to Product Design, which is still a big interest of mine. But I see myself more as a creative thinker rather than a drafter or clay modeler. I like producing the ideas and putting together a good team to execute it. After a year of Industrial Design I decided to switch over to Web Design. I always had a big interest with graphics and web, and knew it would be more interesting to me. It was and I definitely enjoyed it and got a lot out of it. It's not what I want to do now, but I appreciate it a lot. And I can't look at a single website or ad without wanting to make it look better and critiquing it. I can't look at anything design-wise without analyzing it. It's kind of cool to look at things that way though, and to look at the world with the mindset of making things better. While all this school was going on and living in San Francisco, surrounded by artists and creative people, it was hard not to get into photography. If it was to film us biking or my friends skating, everyone that surrounded me had some sort of camera. And in school for a majority of our projects, we needed to use original photography. So rather than stealing from Google images, I ended up focusing more on the photos than the overall web project and design aspect. That's when I really fell in love with it. Because I knew how much better my websites would look with beautiful photos. To me you needed both. Or it all falls apart. That's when I realized I would prefer a photography career rather than a web design career. So, I decided to finish up enough to get my Associates of Arts instead of pursuing my BFA and spending two more years stuck in school. Best decision I have ever made and I don't look back with any regret. I can always go back if I need to. Not sure for what though! Another thing was going on as well. Because of my new found passion for photography and social media being a web guy, I found myself getting involved in the online photography community pretty young and interacting on pretty much every photo site I could. Flickr, 500px, Google+, Facebook and now Instagram, and so many more. I then started gaining a following, and while I was sitting in web design with my buddy, kind of laughing over the fact I had just gained over a million followers on Google+, that moment kind of made me really think about what I was doing. As you can probably assume from reading how my schooling went, I make fast decisions. That's just what I did. Just like that I was almost done with school. And I moved on, into this crazy freelance world! :: I have a lot of younger students and photographers who, when it comes to photography, ask me to talk about going to college versus not going to school and instead learning in the field. You've done some of both. What advantages would an art school provide an aspiring photographer, and what advantages would not going to an art school provide? I always love this question. Especially when you look at our current education system and where the Internet and Google are. Personally I wouldn't recommend art school for photography or any fine arts for that matter. In reality these days, if you want to learn something, you can easily through the Internet or finding mentors and internships. Or learn online for fractions of the cost of a typical college or university. And then you can learn more from all sorts of different people and get more perspectives than just one teacher in a classroom lecture. I can't say I never took a photo class. But I only took two. One in highschool, which I wasn't as into then, so lacked the attention span for it. The second when I was at the Academy of Art studying Web Design, which was more focused on studio and lighting. Good things to know though, but I wanted to be outside exploring if I were shooting. Not lighting models. I also will say it really depends on the type of photography you want to go into. If you want to shoot a lot of studio and lighting work, then there are definitely advantages to school and classes. Especially because they have a large space and supply all the equipment, which most college students can't afford. So that is a plus! The other great thing a school provides, is physical interaction with other creative people, teachers, friends and connections. In all honestly though, if I were to do it again, I would take marketing classes and business classes. Considering I do that 80%+ of the time now, that is what will make you a career in the arts. It's great if you can create beautiful works of art, but how will clients find you? How you will run a business when you starting making money and have to deal with email, and invoicing and accounting and taxes and insurance and health care. Basically you become a business owner, when you wanted to be an artist! The way I feel about making it as an artist is, you need to be willing to break some rules, and sometimes not listen to everything everyone's telling you. The majority of artists and even CEOs I look up to don't have degrees. They all seemed to have their own path and dream. And they knew the only way to do it was to just dive right into the deep end and go for it. They hit many bumps along the way and fail all the time. But you have to fail to know how to succeed and to fix the mistakes to make them even better. These are people who tend to piss a lot of people off, for just doing something different or "new" that people may not be ready for yet or not fully understand. As an artist, I feel we have a special part in our brain that just knows what we want and we get to a point in life (around college) where we don't want anything else in our way. If you are truly passionate about this as a career and feel it is right, I will always say go for it. You can always go back to school, it's not going anywhere. If anything, it will get cheaper and better down the line. :: I love your Modern-Surf series. Can you talk a little about what inspired that series and the challenges you had creating it? My Modern-Surf Series is an ongoing collection. My goal is to create something unique that can separate myself a little from other surf photographers, by creating fine art rather than journalism style photos. I started taking my first surf photos in June, 2013. I was in Hawaii on Oahu with my buddy and a crew of really good surfers, a few pro and sponsored. At the time, I wasn't completely set on shooting surf at all. I kind of came to shoot landscape, sea, stars, etc. But we had a lot of time to kill during the days, and not everyone is a photographer. So as they surfed, I would kick back on the beach, enjoy some beers and a low to ground tripod, and shoot away. It was actually pretty enjoyable. It's a nice break from what I normally shoot and a lot more relaxing. So I shot thousands of photos over that first trip. I had no idea what to do with them, and pretty much sat on them for six months. Until one day after finishing up some of my black and white architecture shots, I decided to try a similar technique on my surf photos. It was that moment I knew exactly what I wanted to do with them. This all fueled a second trip in January, 2014. I went back with a plan this time and a bigger lens. I wanted to experiment with long exposure surf shots. I have seen it done before, so I knew it was do-able. Just needed to find my style for it. That blurred look you see is mostly created in camera, by doing a shutter drag, leaving the shutter open and basically tracking the surfer trying to keep him in focus and everything else blurred. I then use software like Adobe Photoshop Lightroom to give it that dark mono look which I like to call 'Modern.' I am always trying to perfect and adapt this style, which gets me excited to keep it going. 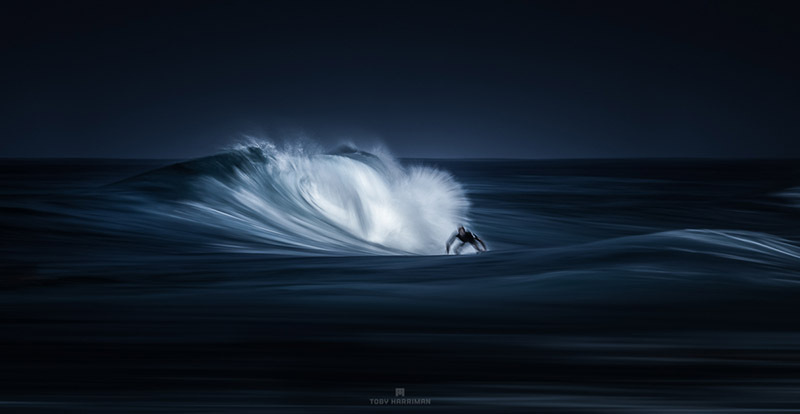 When I look at this series, it really allows me to focus in and to see the connection between the surfer and the power of the ocean, which is what I am trying to create for the viewer. Something with deeper meaning and something that makes people look at a subject in a whole different perspective. :: You've been doing a lot of time-lapse shorts over the past few years. 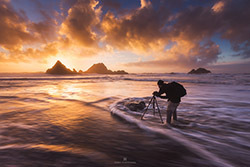 What moved you from the single stills into time-lapse shooting? Creatively, how does shooting a moving piece differ in the way you pre-visualize a scene or plan a shoot? I got into time-lapse because I was so inspired by time-lapse films like Timescapes from Tom Lowe or The Mountain and all of TSO Photography's films. And to me I just wanted to make my pictures and turn them into motion. I don't think my creative process changed a whole lot. I always tried to make my time-lapse look exactly how I would want my picture to look as if I took a still from the clip. I obviously have to plan a lot differently though, as there is more gear, longer setup times and making sure you capture the full length of the scene you want to capture. Lots of tricks as well to help keep the clips cleaner, less flickery and less jumpy. :: Your latest time-lapse piece, Gotham City, has received a lot of praise, and is truly remarkable to see. What inspired that piece, and what challenges did you have creating it? Did it start out always being monochrome in concept or did something happen in the filming to make you think black and white might work better? Thank you! Gotham City SF actually started as a photo series I did back in January, 2013. I knew I wanted to create a time lapse film using a similar style. A lot of the photos I was taking I was also time-lapsing, so over a course of two years, I just collected footage every time I went out. I stockpiled terabytes of footage. It definitely took some time to consolidate it and get it all processed. Learned a lot of my workflow with this one. I had everything planned out for this project, from a custom logo to an original composed score and even how I wanted to release it all with a custom website and stuff for sale. Unfortunately I haven't gotten to the prints and other products yet. Maybe someday! The project took a lot longer than I expected, too. 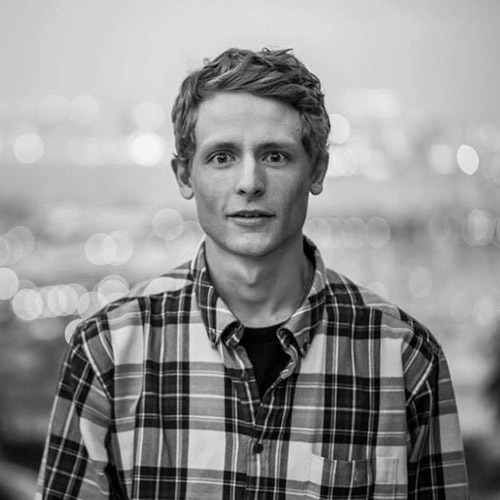 My composer, James Everingham from the UK, was 14 at the time I hired him to make the score. He was 16 when I finally released my film! A lot of the delay was because I had other work, distractions and projects going on, and paid work came before a personal project, unfortunately. It did allow me time to touch up my skills and also get better conditions, views and then even a helicopter heli-lapse in the end. Gotham City and my Modern-Surf series are two personal projects I am definitely proud of. :: Time-Lapse photography has really taken off in the past five years. Where do you see your craft in this realm heading in the years to come to stay innovative and creatively in the forefront of those doing this type of work? This is a tough question which I don't even think I have the answer to, yet, at least. For me I will always be pushing myself to create something different and something with a unique touch and style to it. The amount of time-lapsers and photographers that will arise in coming years will be scary. But that won't stop me from just focusing on my own craft. To me time-lapse is just a tool to help tell a bigger story. And the story is just beginning and will always be changing. :: Is there any kind of shooting or photography that you don't think you'll do? For instance, I notice while you have a great deal of outdoor photography, you don't really do any wildlife shooting. Are you finding your wheelhouse and trying to stick with that? There are definitely things I refuse to shoot. Like weddings for example. I did one for a family member and will never do another one. I just don't like the whole situation. I don't get the creative freedom I want with it. I like the mentality of shooting for myself first and hoping a client likes it later. Rather than a client telling me what they want. I know it's not the the easiest when it comes to paying jobs in our industry but that just pushes me to make it this even more. I also refuse to do events, I am not a bar guy and party scene guy (I do like good beer, but kind of hate going to bars). So I usually turn event requests down. Portraits as well. For me right now, I am really focusing on specializing in aerial photography, from helicopters, not so much drones yet. I am obsessed with aerial now and plan to shoot from helicopters in every city I can get to, no matter how broke I get! This has recently became a bigger passion, and I have been fortunate enough to now build a few client relationships which gives me work in that field throughout the year. Other than aerial, I plan to continue to time-lapse and take landscape photos, but will also be getting more into video. To me my wheelhouse will also be changing and adapting to stay ahead making sure I am able to provide clients with fresh unique content. But also to make sure I am happy and sticking to my roots doing what I love first. :: You seem to be as comfortable within the city as out in the country. Is there one kind of shooting you prefer, given the choice? Well, as said a few times, aerial is my cup of tea right now. And I don't care where it is, I will shoot anywhere from a helicopter if the opportunity arises. I prefer cities and mountain ranges best though, from the sky or on the ground. I also prefer weather, so clouds, fog, auroras, you name it. I will say, blue skies and daytime kind of bore me, unless I'm shooting surf. 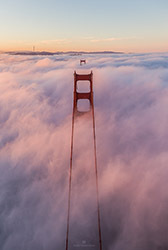 :: You have done a couple different aerial shoots over San Francisco, which looked amazing. Can you describe that experience and creatively how you prepare to do a shoot like that? Do you use Google Earth to try and help give you an idea on what it might look like from above so you can tell the pilot what you're looking for? There's some technical issues too that differ a great deal from what you are probably used to while shooting from a tripod. What was the learning curve like for that? How scary was it? [Quote] "It's a way of seeing what we see everyday, but looking at it from a different perspective." Aw, yes, aerial of San Francisco. This was something I wanted to do for a long long time. Shooting all over San Francisco for a few years has been amazing, but I need some new vantage points. Nothing beats a flight over SF and flying under and over the Golden Gate Bridge in my opinion. Especially if you are graced with that classic low fog at sunrise or sunset. I have been fortunate enough to start working with a few clients creating backplates for some of San Francisco's future and largest skyscrapers and new development going on downtown. So when it comes to planning there is actually a lot that goes into these flights. If I am going up just for fun, all I have to plan for is making sure the weather is what I want or the pilot can even fly. If I am shooting a job, that matters even more, but we are also using pre-existing renderings with specific GPS coordinates, elevations, lens focal length and specific time of day. And sometimes it may take a few days and flights to get all the shots we need. It can also take months, just waiting on the right weather to match up. When I started shooting aerial, I was not prepared for the technical transition that I was use to. I am used to a tripod and long exposures. To tell you the truth, the first flight I went on, I messed up 80% of the shots, because I didn't shoot fast enough and also shot on stupid AV mode. Fail! Now I tend to have higher ISO and faster shutter and all manual. As it gets darker I make it a point to not shoot slower than 1/320 of a second. I sometimes use a Gryo Stabilizer to help with motion blur, but find that really doesn't help as much as I would like it to. Unless I'm shooting video, then it's key! :: What is the scariest thing that has happened to you while out on a shoot? I was almost taken out to sea down at Pacifica Pier (San Francisco). I usually always get too close and get taken out by waves. I get at least knee deep every time. I like to quote, 'If you didn't get wet it wasn't a success.' Swells can be very unpredictable, I am probably smarter and more cautious now, but then, not so much. But this one I remember well. I was right under the pier, shooting away. The swell came in and before I knew it I was belly deep, holding my camera and tripod over my head and falling back. Everything got soaked and ended up completely submerged. My phone broke and my camera started to causing issues days after. I was probably fine and this wasn't that scary, but it could always be worse. And I guess I consider myself lucky that I haven't been in a super scary situation yet. I have had very similar situations to this in the past few years. But since the first one, I have been smarter and saved myself from some situations that could have been bad. :: What is your favorite piece of non-photographic gear, and why? Sadly, my phone. But more importantly the apps that can be downloaded on it. There are so many apps that help me plan, get stuff done, share instantly, get update on the fly if in service and even the basics of email and responding to people. I will list a few. Todoist: My to do app, really love how similar this one is to use and it sinks with my desktop app at home too. This really helps me remember to do everything! PhotoPills: If you are a photographer, you have to have this app (Or the other one TPE, either work but I prefer PhotoPills) You can pick a point and see exactly where you will be at at a certain time and where the sun and moon will rise and set. It give all the moon and sun information. There are a bunch of other great features, personally I haven't really explored deep enough into all of them. I use what I need! Square Cash: If I am paying off contractor's, other artists I help licensing with, rent or just paying back your friends on trips for food and gas. This app is amazing. You link your debit card/bank (No credit unfortunately) And you can send cash back and forth with one click. Once you have used it once or twice, you wont have to appact incoming cash, it auto redirects to your bank account. I really love this app! Dropbox: I do my main backups to multiple RAIDs and Amazon Glacier (The Cloud) But use dropbox for my day to day use. I backup a lot of my "finished" work to it, so if I am on the go I can easily link to a client, this has been huge with timelapse and is saving my a ton of time now. My favorite use though is my "daily photos" folder. I dump all sorts of photos to this, finished or close to finished, or just photos I don't really see as portfolio worthy. Then when I am on the go and need something to share on Instagram, this is where I get the photos to share. Those are probably what I call my productivity apps. I could get into social, but I assume we all know what the social apps do, I use pretty much all of them. So many more apps, it's sad! :: Social Media has been around probably most of your career, and you started (I think) with it being an option. How did these platforms play into how you planned to market yourself in the beginning, and how have they helped? What drawbacks or negatives do you think they have on the photography community? I can probably say I am where I am today because of the help social media has provided. Not because of a large following or how many likes you get or any of that nonsense. But because of the people, friends and connections I have made through it all. And how much I have learned and taken away from it. You have to work for it though, it doesn't provide if you don't do anything. Yes, I can also say, it's now way too overwhelming and I wish it would just disappear and we would all forget about it sometimes. But it's also an incredibly powerful resource, and how the world now connects to everything and everyone. When I started I used mostly Flickr, that was all the buzz then. I basically taught myself how to shoot by studying EXIF data and trying to mimic shots from the local photographers I looked up to. I figured if I could get a shot to look like theirs then I was on the right path. For me that was learning the basics. Once I felt like I knew what I was doing I then started experimenting with different styles and processing and so on. I learned and failed how to shoot with filter doing long exposures by going out in the middle of the night, standing on a cliff over the Pacific and taking 1-hour exposures. I had no idea what I was doing. But once I came back from that, I knew exactly what to study and look up. This is kind of why my brain doesn't deal with standard education very well. I work backwards like a problem solver. I would rather try it first not knowing what I am doing and then learn from my mistakes and what I couldn't figure out. To this day I try to use all the services and spread my work out as much as I can. I look at it this way... you never know what service the client prefers, just cause we don't like X site doesn't mean the person that may find you and hire you doesn't. I also make sure I rename all my files and keyword every photo. That way I can be found in searches. Because of this, I get found for jobs and image licensing on sites like Flickr, Google, or so on. I use to on 500px but their new search kind of tanked recently in my opinion. It's amazing how the search results on a site you use can make a huge impact on your business. Food for thought! However, as much as I like all this social media, I am focusing more and more on my personal website these days. Social media is great, but in reality its filled with a lot of other photographers doing the same thing and just following the same people so our feeds are filled with more pretty photos. Sadly, not as many clients are in on this! :: What is on your horizon for the next year in terms of what you would like to shoot or work on? So many things! To start, I am spending June and July backpacking around Alaska with my friend and capturing as much as I can, from stills, time-lapse, to video. I am becoming a Brand Ambassador with Adobe and going to be working with them on some social media stuff, really stoked on this one! Other than that I plan to continue my hustle on building relationships with more brands, working with my existing clients, getting more work in the aerial field as well as fine tuning my path as a full time artist. I also want to check off a few travel bucket list items, like Iceland, Norway, the Alps, New Zealand and so on. I plan to take a trip to Hawaii again at some point, and I will most likely be chasing fall colors in Colorado and hopefully after on to the East Coast this fall. "The way I feel about making it as an artist... be willing to break some rules, and sometimes not listen to everything everyone's telling you. The majority of artists and even CEOs I look up to... seemed to have their own path and dream. And they knew... to just dive right into the deep end and go for it."